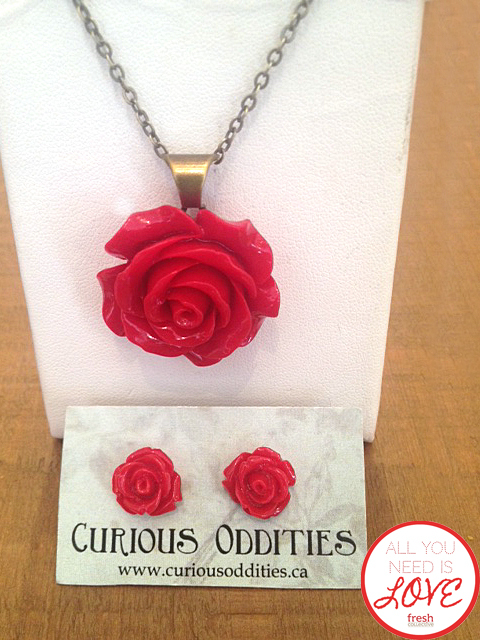 Ever wonder how designer Kat Shura creates the beautiful pieces in her Curious Oddities collections? We journey with her on her travels through Belgium, Nevada and Ohio to seek out the gorgeous found treasures she includes in her line. “C’est combien?” I ask the man leaning over the table. He looks down at my grubby, outstretched hands that display a chaotic mess of aged paper, bits of brass, keys, broken glass and hardware. “Quinze” he replies. Struggling to match his Morrocan-Belgian accented French to my own very limited, grade 11/12 French, I play it safe and handed him a 20 Euro note. Stuffing my change into my pocket, I take the brown paper bag of treasures and move to the next stall to dig through another mound of boxes. Littered with old buttons, ancient wooden spools and shoe forms, this one’s an exciting collection, cleared out of an old garment factory. From the outdoor junk market in Belgium to the wilds of the Nevada desert, from a crystal mine in California to an antique mall in Ohio, collecting is the most delightful part of my job as Curator for the Curious Oddities collection. Working with salvaged materials is a wonderful challenge: to combine materials and finishes, to breathe new life into cast-away pieces. Exposure to a variety of antiquities also serves as an inspiration for the pieces that I compile from new material, providing a reference for surface treatments and design. 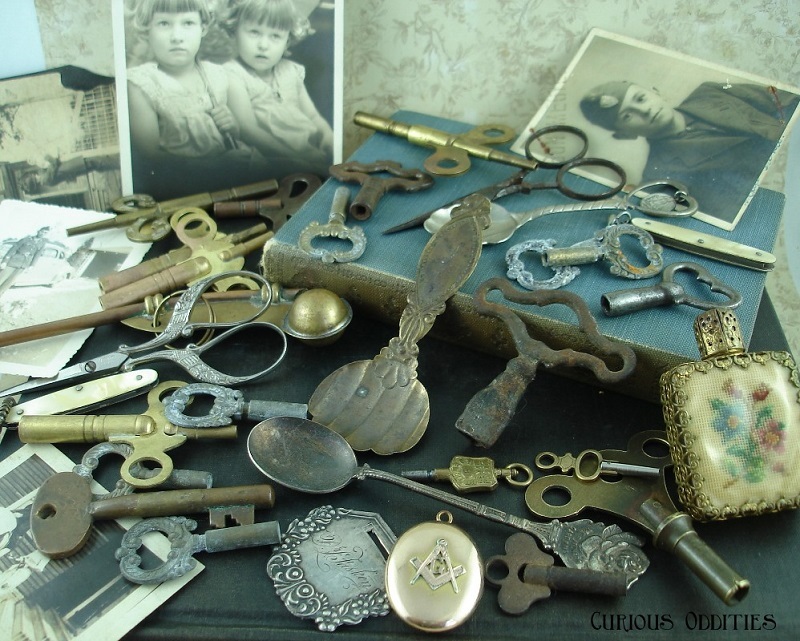 It’s lovely to be able to share both my found treasures and the new pieces that I compile. I hope that the Curious Oddities collection inspires in you the stories of our history, the stories of your family and of your imagination. Mother’s Day is THIS SUNDAY! Give her a gift as unique as she is. It’s fast approaching! Have you picked something up for your Mom yet? Don’t worry – we’ve got you covered! Stop by or call any of our stores and we’ll help you hand pick a beautiful piece of one of a kind, stunning jewellery that will make this Mother’s Day one she’ll never forget. I spend far more money on jewellery than on shoes. Far more. Simply put, the jewellery which surrounds me daily is hand-crafted by the lovely folks I love and work with, plus is far more affordable than a new pair of wedge heels, double plus will likely leave my feet feeling better at the end of the day. So this week, I wanted to shine the spotlight on some of our most on-trend items and give kudos and shout-outs to the folks who made them with love. Oh, and FYI, the top that I’m wearing in ALL of these pics is one of my new favourite arrivals in-store! This is the Kyle top by Melow par Melissa Bolduc. Its actually TWO one-shouldered tops which can be worn a variety of different ways to take you from casual to athletic to flirty! 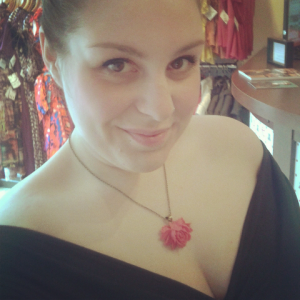 I’m wearing it in black (to let the jewellery shine, of course!) 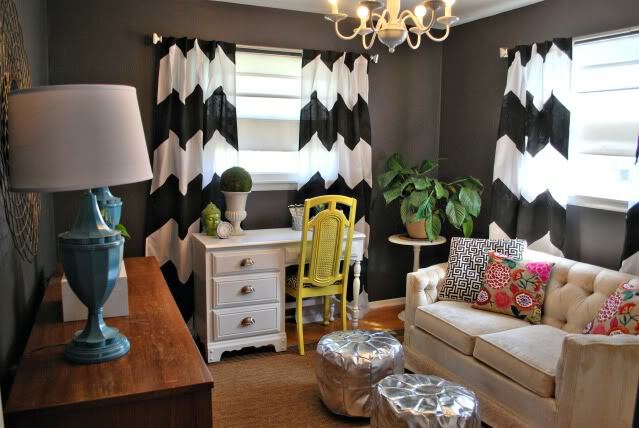 but we also have it in emerald green, navy blue, and black and white jailhouse stripes! 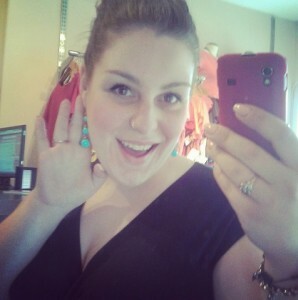 Turquoise beaded earrings from Sugar Rush. Featuring antiqued brass fixtures and lever-back fasteners. Available in other colours! 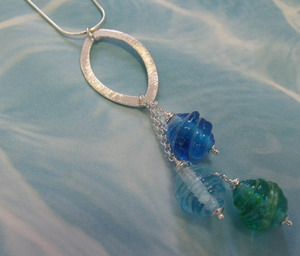 Hand-layered glass pendant from SailorGirl. Large domed glass pendant featuring swirls of transparent and opaque tangerine glass, hung on a sterling silver chain with lobster-claw fastener. Also available in other colours including blends of sterling silver sheets within glass, and multi-toned glass. 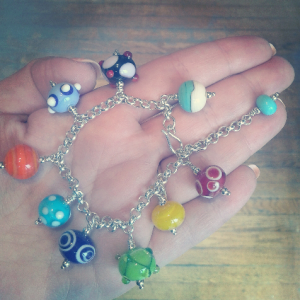 Layered glass Carnival charm bracelet from SailorGirl. 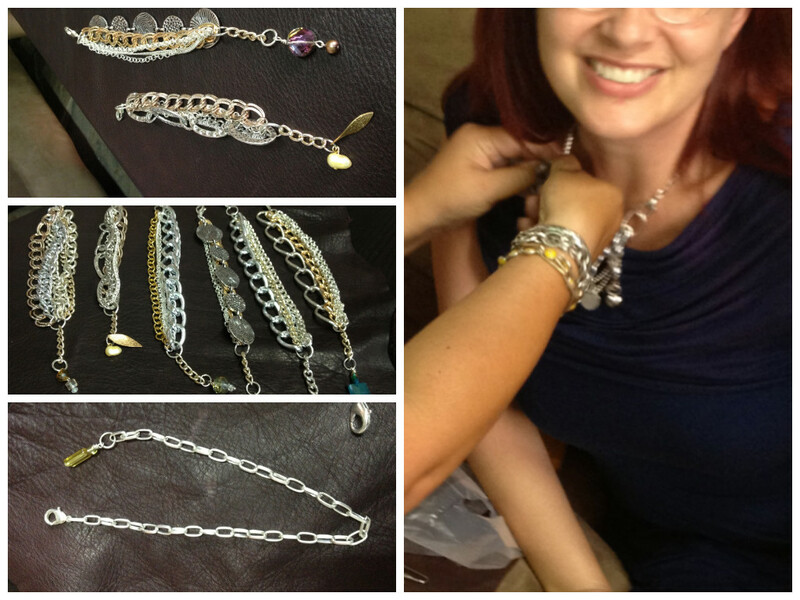 Each bead is hand formed and layered, then suspended on a sterling silver bracelet. Style also available in other collections including Tuscan Vineyard and Ocean Wave. 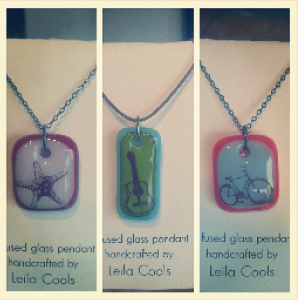 Fused glass pendants from Leila Cools. Each unique pendant features a one-of-a-kind colour and image combination. A Fresh Collective best-seller for years, these are available in a multitude of shapes, sizes and images to suit every wearer. The advantage of springtime is the lack of necessity in bulking up with layers of heavy fabrics and stiff textures. We start to see chiffon, linen, goslin and light cotton weaves making their much-welcomed comeback, and we crave the warm breeze of a calm summer’s day. Hey, soul sister, its time to appreciate the art in the world around us, and that spills right over into the jewellery you choose to adorn yourself with. Get in touch with your artsy earthy side this summer with some of these! Pair these with flowwy skirts, tunic tops and your very favourite denim jeans. 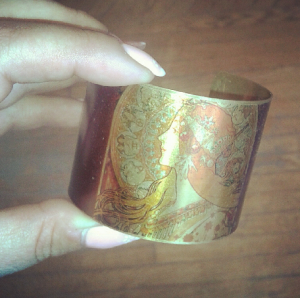 A Printed Brass cuff from Odd Bird. Featuring this classic image layered sheerly over a lightweight brass cuff. Fully adjustable! This Esmerelda-inspired set is hand-crafted from the Sugar Rush spring romance collection. Featuring verdegrised brass hardware and coins, turquoise and seafoam beads and lever-back style fasteners. Similar styles available in other colour collections. 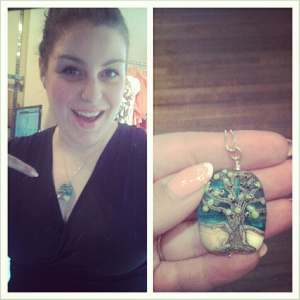 Hand-crafted glass Tree of Life pendant from SailorGirl. This piece is created using many consistencies, layers and textures of glass to create realistic bark and a textured finish to the touch. Soon available in Cherry Tree colour combo as well. 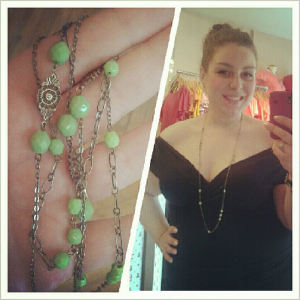 Double-long kelly green beaded necklace from Curious Oddities. Soft green faceted beads set on a hand-linked brass chain featuring intricate patterns and fixtures. Can be created to order in many custom colour combinations and lengths. 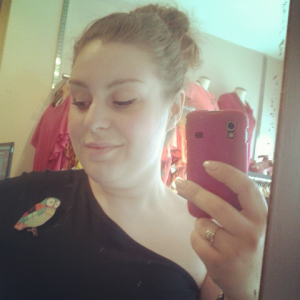 Birds have claimed their place in the hearts of fashionistas everywhere. Symbolic of freedom and peace, birds have been ruffling some feathers (see what I did there?) 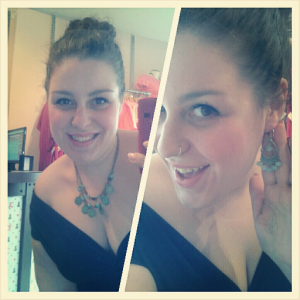 lately, and we’ve got the most adorable accessories to compliment your springtime wardrobe… no chirping included! If realism is your thing, we’ve got you covered there too, but my very favourite of the birdy jewellery is cartoon-inspired, charming and playful. Wear these with a cute summer dress with a matching cardigan, a bright blouse or a co-ordinating purse! 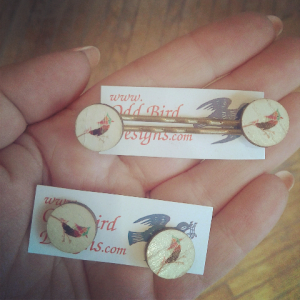 Hand-inked jay bird studs earrings and hairpins from Odd Bird. Printed on tiny slices of fallen branches, these colourful jays are retro-licious and just a tiny pop of cheekiness. Earrings on coated brass backings, hairpins on brass crimped pins. Wood-cut owl brooch from Odd Bird. Featuring argyle wings, this laminated piece is attached to a slim-fit silvertone pin backing. Adorable on blazers, jackets, scarves, hats and bags. 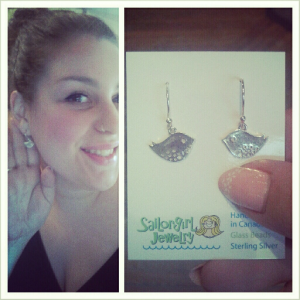 Sterling silver bird earrings from SailorGirl. These hammered silver birdies are affixed to fish-hook posts. 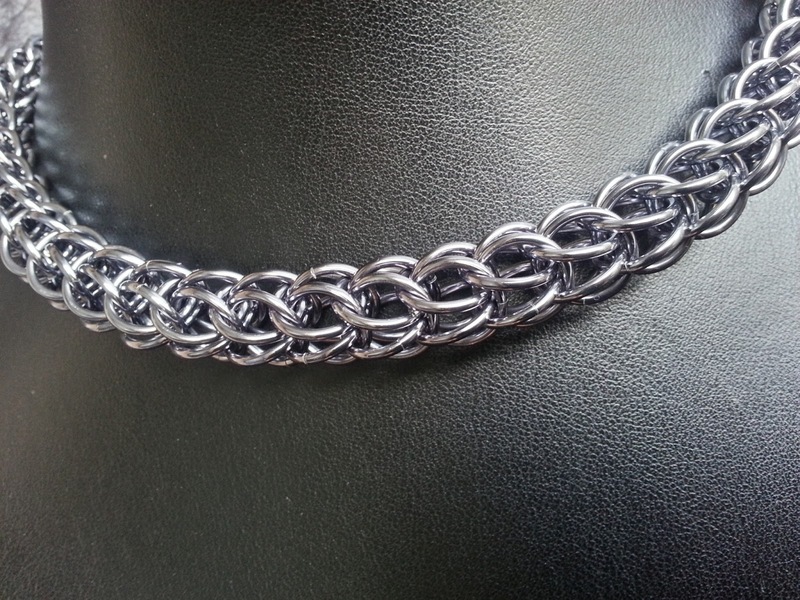 Also available in a matching pendant on a sterling silver ball chain. Maybe it’s the release of the Great Gatsby (I <3 Baz Luhrmann). Maybe it’s the general “in-ness” of retro-current fashion, or maybe folks are simply falling in love with romantic side of feminine jewellery. Sweet, ladylike accessories are IN, in a big way. This generation’s take on the prim styles feature more volume, whimsical details and unexpected splashes of colour. Paired with lace and chiffon, clean ivories or petal pinks, these feminine pieces will make you feel like YOU’RE the only girl in the world! Layered brass necklace with capsuled brass key from Vanessa Yannow. 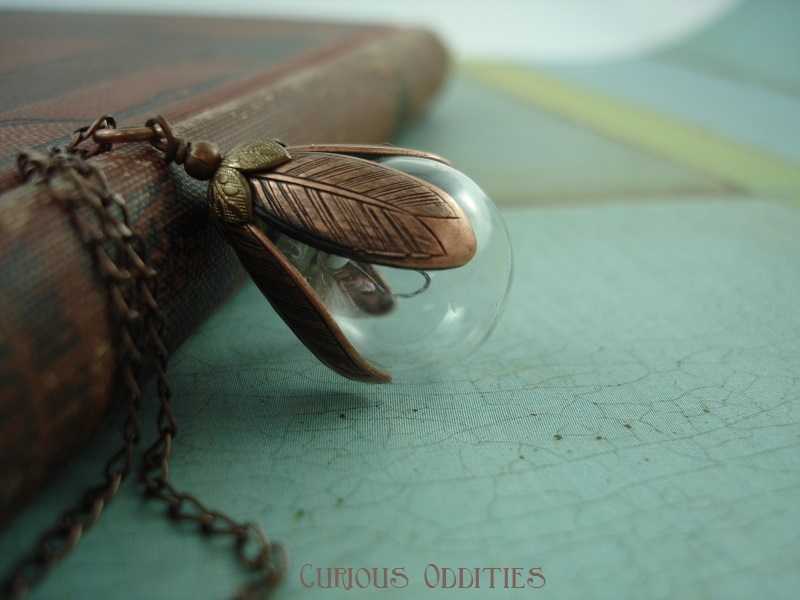 Each unique necklace features a capsuled vintage charm or a vibrant feather. 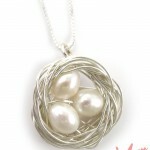 This style available in silver, and with several different capsule pendants. Matching earrings also available. 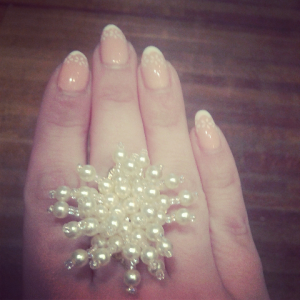 Pearl Burst ring from Sugar Rush. Pearlized beads fastened alongside glass and crystal beads to create a burst of texture and shine, reminiscent of fireworks exploding in the sky. Ring is fully adjustable, wide band style made from antiqued brass. 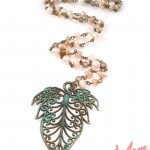 Also available in soft pink pearls, and seafoam pearls. 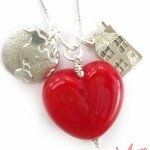 Filligree heart pendant from Sugar Rush. 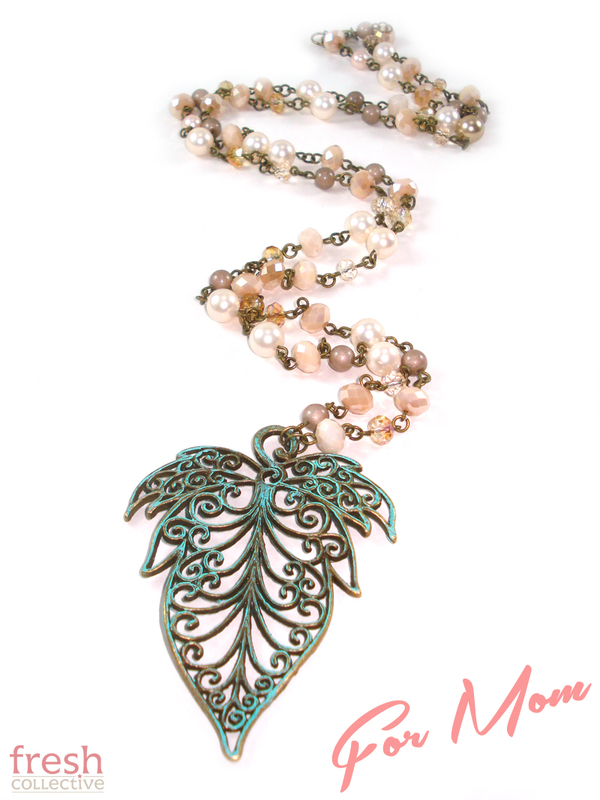 This large hand-verdegrised heart pendant is set upon a powder blue chain, and complimented by pearlized and crystal beads. 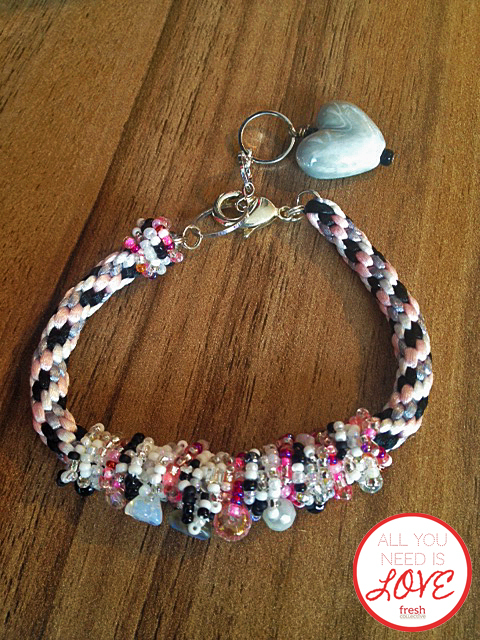 One of a kind, but similar items are available from the Summer Romance collection. What’s more fun than circle skirts and adorable kitten heels? Vamping up like their bad-girl counterparts and getting in touch with your retro-rockabilly rockstar side! Polks dots, bold florals and juicy cherries are always a sure sign of fabulous weather, and this spring will be no exception. Hollywood’s hottest IT girls are rocking blatantly 50s style digs, and style queens like Zooey Deschanel, Gwen Stefani, Christina Hendricks and Dita Von Teese are all fans of the throwback styles. Get girly with us! Resin rose pendant by Curious Oddities. 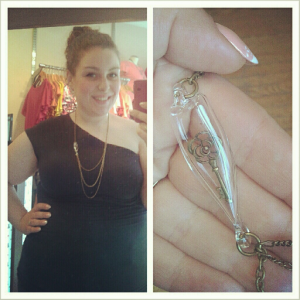 Set on an antiqued brass chain, this necklace is the hottest selling piece of the season. Available in a rainbow of colours, and a variety of sizes, these flowers are also available on rings and lockets as well. 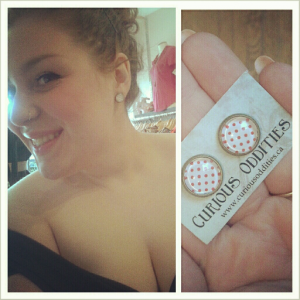 Red-on-white polka dot studs by Curious Oddities. Brass-framed studs are hand-set with glass domes and fused for durability. Brass is coated and long-wearing, and nickel-free. Butterfly backings. These are available in a variety of colour combinations and prints, plus matching pendants, bangles and hairpins! 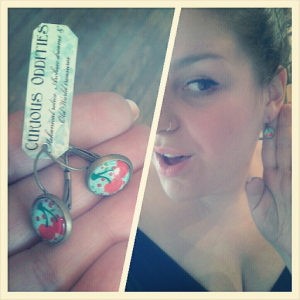 Cherry Lever-back drop earrings. Framed in the same setting as their polka dot counterparts above, these drops hang about a centimeter down and feature a levered back. Cherry background shown in light blue, also available in black and white, and in pendants, bangles and hairpins. See something you love? Drop me a line at Jamie@freshcollective.com to chat about the items shown here. All items available for purchase, and may be able to be customized or adjusted for preference and fit. Many of our designers can accomodate custom items, and offer full collections of beautiful, locally made treasures. Looking forward to seeing you all in-store! 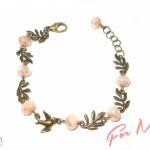 We’re pleased to welcome another gorgeous line of accessories to the Fresh Collective family! These beautifully crafted accessories featuring gorgeous textiles will be making an appearance at FC Queen THIS WEEK! 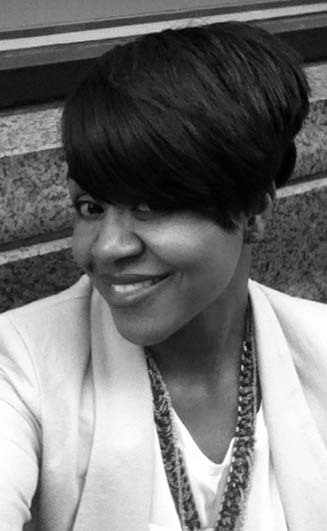 Monique Anderson successfully received a BA in fashion design from Ryerson University in 2004. Although her love for apparel was very apparent, it was while visiting India that she was inspired to realize her true calling. Her adoration of unique textiles and secret obsession for jewellery meant more than just a shopping experience – it was a way of life. Having been surrounded by colourful textiles and intricate artwork all her life, as a result of an Afro-Caribbean upbringing, Monique’s Indian excursion sparked an interest that had remained dormant for a long time. Monique then took her two loves – jewelry and textiles – and fused them together to give birth to I’MONIQ Accessories. 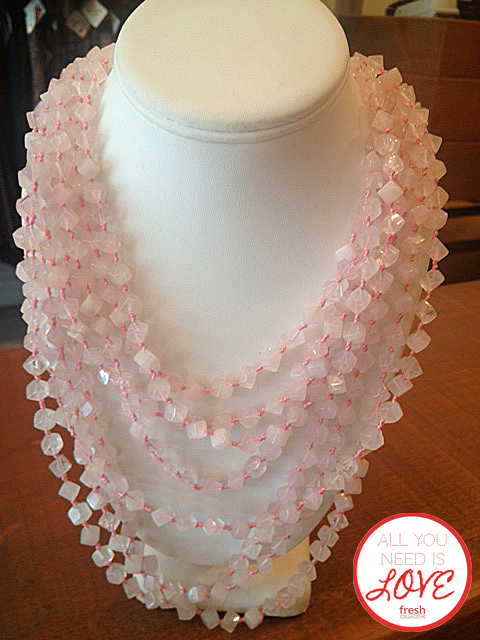 I’MONIQ Accessories incorporates rich textiles offering a new and fresh take on costume jewelry. The silk scarves used in each piece are hand-dyed in different cities and villages from around the world including Bali, Thailand, and Chennai. These colourful and luxurious scarves are then knotted and combined with diverse materials and transformed into amazing new art forms. 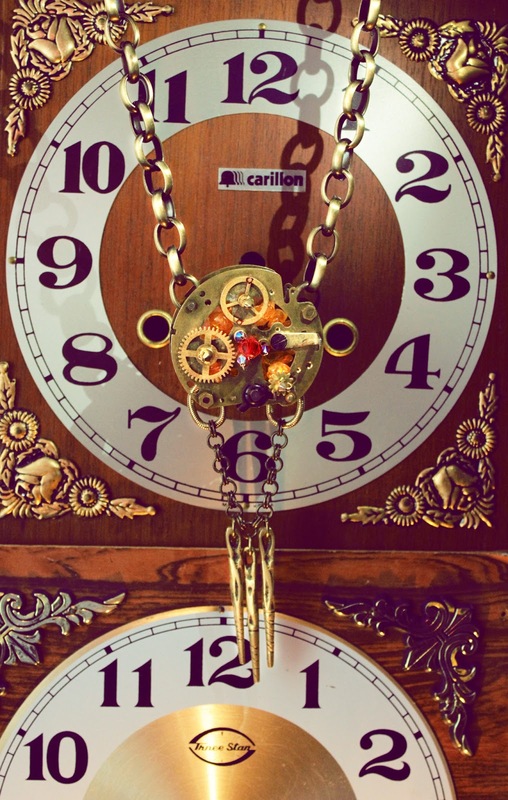 A great deal of time, craftsmanship and care goes into each piece resulting in intricate and unique jewelry to complete the finest of collections. Hand-crafted in Monique’s Toronto-based studio, I’MONIQ offers limited runs of necklaces, bracelets and earrings composed of strong mixed metals, crystals and vibrant silks from cities and villages across the globe. Prices range from $50 – $350. Check out some stunning designs at the I’Moniq pop up shop this Wednesday and Thursday (Feb 13th and 14th) at our Queen Street store! 1pm-5pm daily. 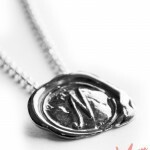 Valentines Day is around the corner, and Fresh Collective has you covered with beautiful love-themed jewellery and accessories (maybe you want to accidentally leave this blog post open on your significant others’ computer? hint hint)! Whether you’re seeking a gift for a special someone in your life, or a little something sweet for yourself, we’ve got the goods – handcrafted by local designers and made with LOVE! 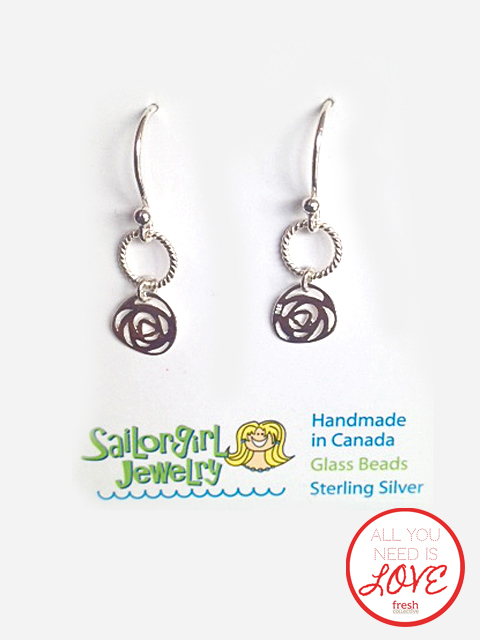 Sterling Silver rose earrings from new FC addition Sailor Girl Jewellery – Only $20! 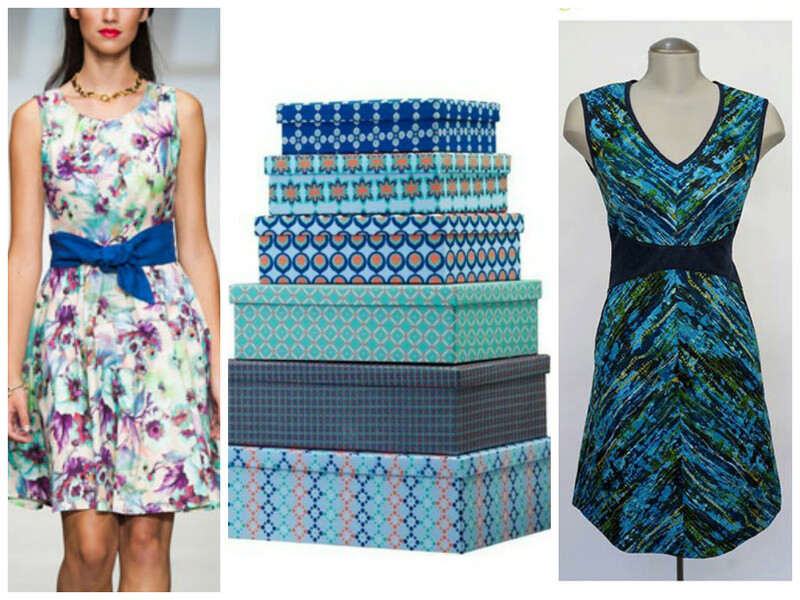 Which of these stunning pieces do you hope finds it’s way to you this February 14th? 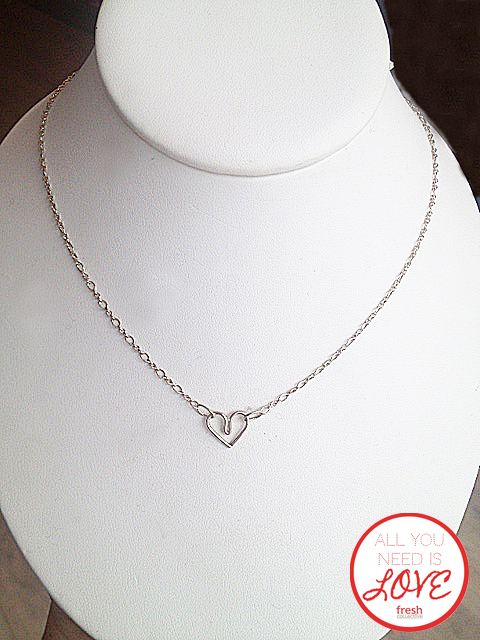 See more great Valentine’s jewellery on the FC Facebook Page! 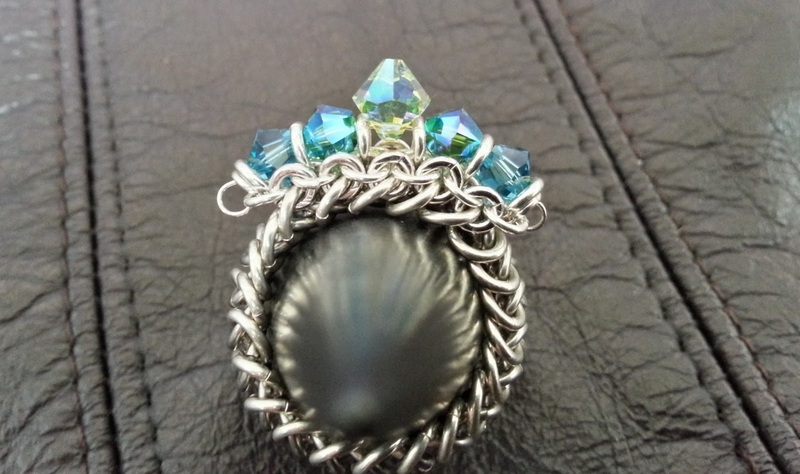 I am a Jewellery designer who specifies in Chainmaile, Steam Punk & recycled Vintage/Antique Jewellery , Lapidary (faceting and polishing semi-precious stones), Wire Jewellery & Wire wrapping stones I polish myself. I love hunting for new product to use, Have it be an auction, a thrift store, bazaars, antique shoppes or even online. I tend to keep away from all the made in China Jewelley components and sway more towards; American, Canadian, Austrian, European and Antique/Vintage Parts. Its all about who has the best quality to me so I can ensure my pieces are built to last and will not require repairs with normal use! Used for the majority of my Chainmaile pieces. A lightweight , strong, non-tarnish metal. Similar to Gold Filled in the sense of 10% of the the metal contains the colour so it will not rub off like gold or silver plating does. 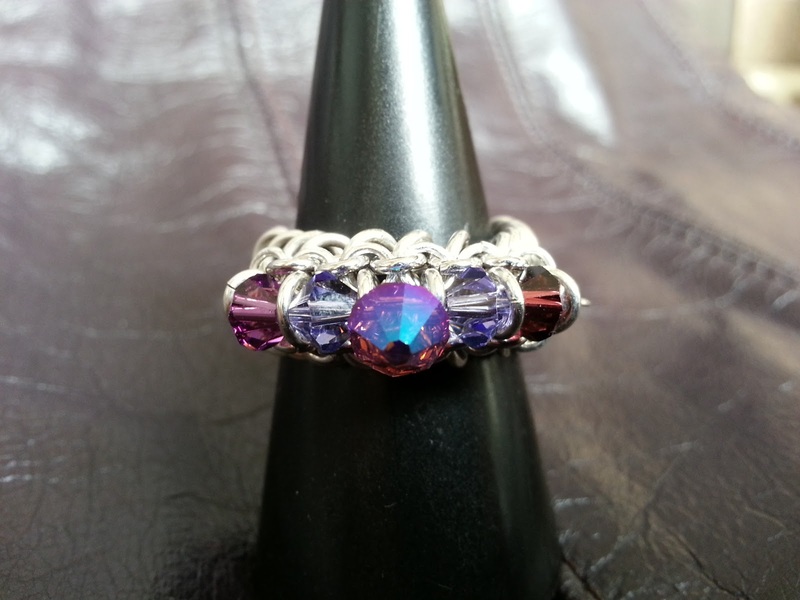 Check out my Sterling Silver Chainmaile Rings – available at Fresh Collective Queen location! They can easily be sized to fit and can be custom made with any colour Swarovski Crystal. Yet it be a Vintage German Coo-coo clock, an old 50’s wind up Alarm clock, A Pocket Watch or even an old mantle-wall mount clock, I’m there and I’m taking it apart! 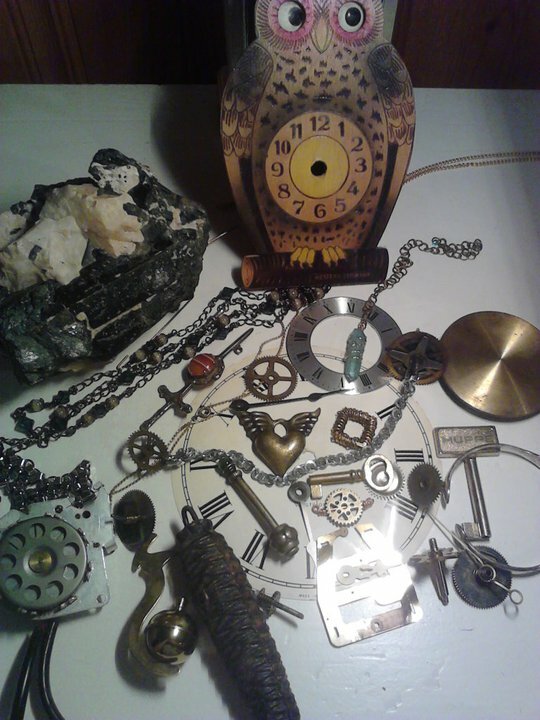 I love taking watches and clock and re-working them into pieces of jewellery. It never gets old looking at a ticking clock with all its moving gears. 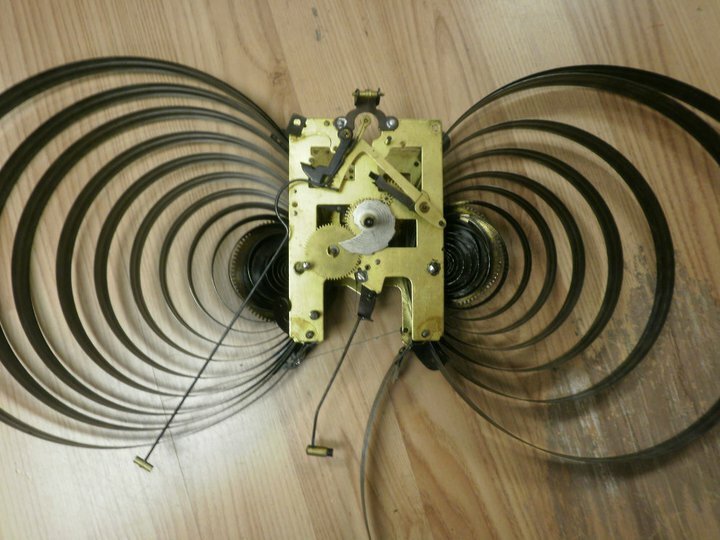 Some clocks stay whole and others end up with their insides out so they can be re-purposed into something else. 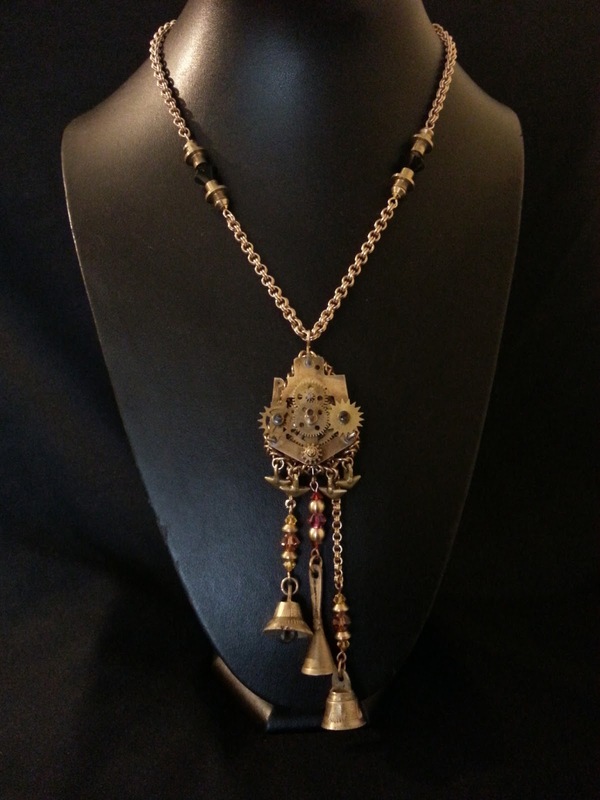 Antique German Coo-coo clock, Vintage Indian Brass bells, Swarovski & Precosia Crystals with Jewelers Brass chain Hand linked (Chainmaile) by me. 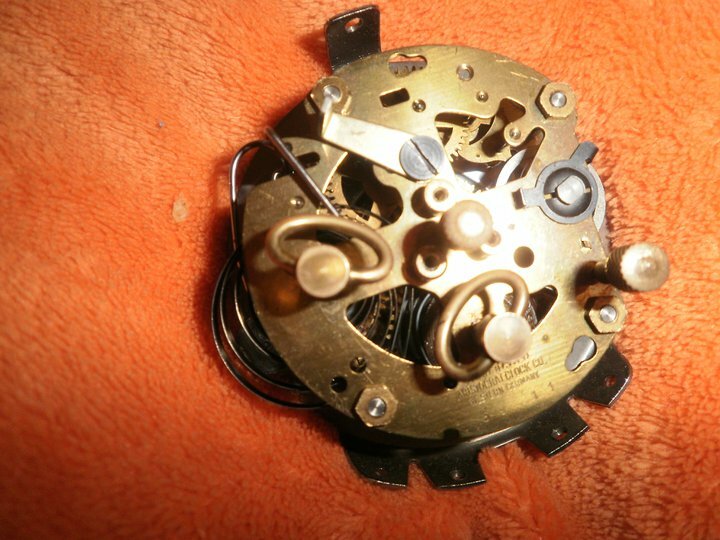 Taking apart any wind up clock can be very dangerous! The larger clocks have over 60 feet of steel cord wrapped up inside, and the second you take the last screw off and give it a nudge it will all spring out into action , gears will go flying and the sound it makes usually leaves me with a bit of an adrenaline rush afterwards! 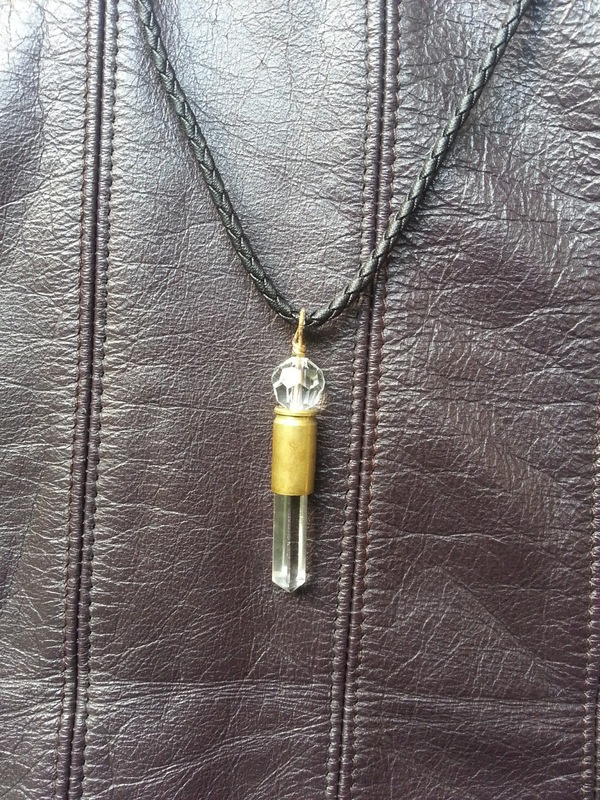 Vintage Brass Bullet shell, Faceted Clear Quartz, Precosia Crystal. Reiki Infused on a Braided Cotton cord. 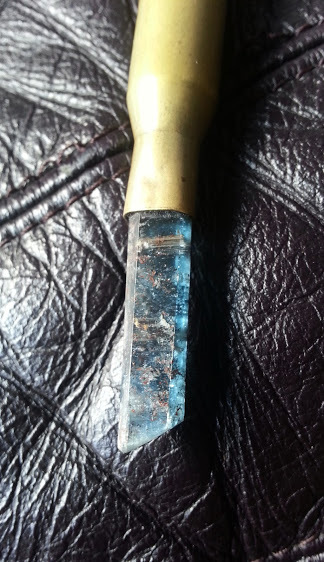 I love the raw minerals, unpolished or polished they are all beautiful. Stones all have natural healing properties which is why I infuse my stones with Reiki. This way the stone has been pre-programmed to do what it does best and it also wont need to be cleared of stale energy. Here are a few pictures of my Reiki Infused Bullet Pendants at Fresh Collective and come pop by this weekend if you have any questions or if you would like a specific stone to aid you in your quest! Vintage Brass Bullet Shell. 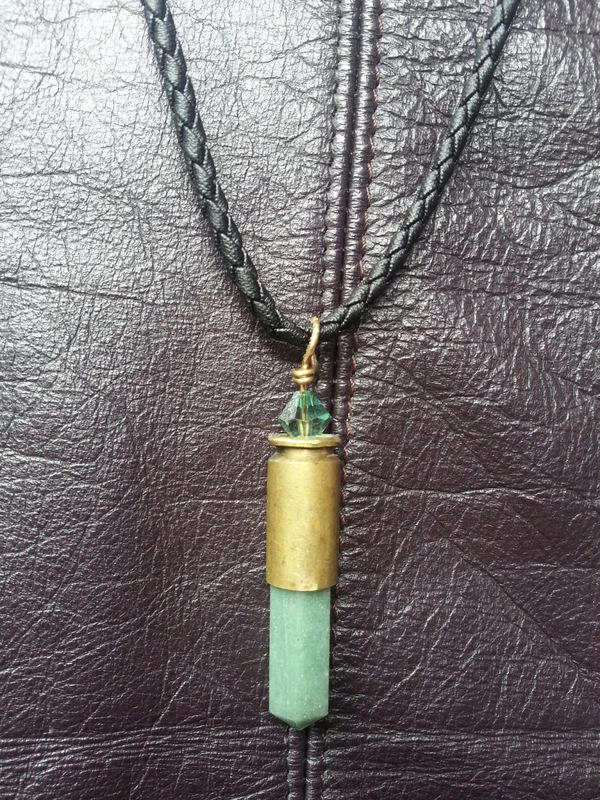 Faceted Green Adventurine stone, Erinite Swarovski Crystal, Braided cotton cord. Reiki Infused. I am currently in the market for some new machinery and I will be introducing my Lapidary jewellery line very soon! That about sums up what I do and what I’m about! 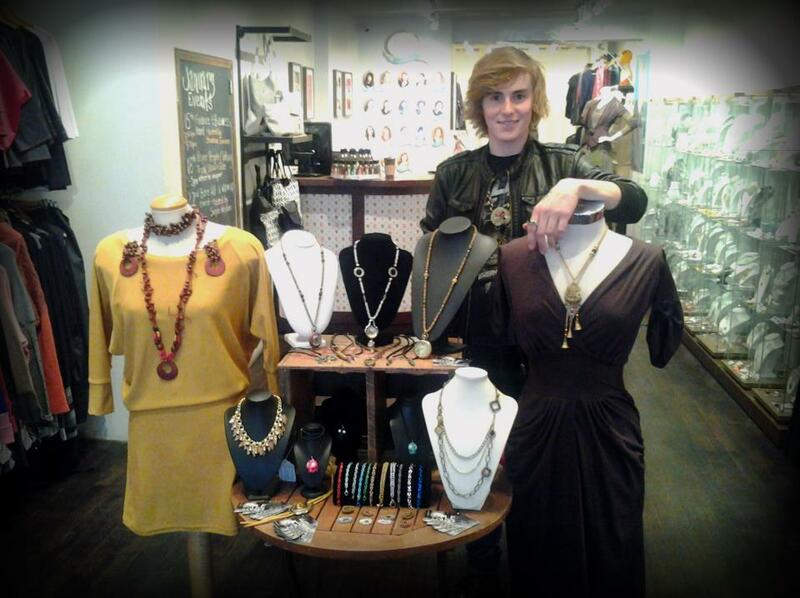 I hope to see you all at my Trunk show at Fresh Collective Queen this weekend! We’re excited to welcome another talented and amazing designer to the FC fold! 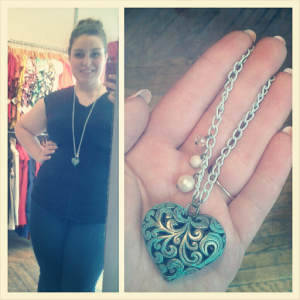 We now carry Sailor Girl Jewelry at our Roncesvalles location. I make glass beads using a technique called lampworking or flameworking. I use a gas/oxygen torch to melt rods of glass. My raw glass is Moretti glass from Italy. The melted glass is wound around a thin steel rod (called a mandrel), then shaped and decorated with thin rods of glass (called stringers). Some of the beads have silver leaf added inside. There is no paint on any of my beads, they are all layers and layers of glass. All of my beads are annealed (baked) in a kiln at approximately 950 degrees F. This removes stress from the glass and prevents the bead from cracking. Because my beads are annealed, they are durable. Try not to drop them on cement or marble. They will hold up well under normal, everyday wear. As they are handmade, each bead is unique. While I do my very best to produce exactly what you see on the screen, there will be some slight variations in the beads. My goal is to live an inspired, adventurous, creative life. I love sailing. I spend a couple of months every year on my small white sailboat in warm waters. I make glass beads. 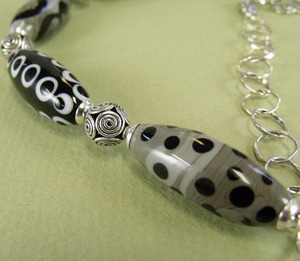 I design and sell jewelry with my glass beads. I ride my bike everywhere. Once upon a time I rode my bike around Ireland. I’m learning Spanish (it’s been 20 years). I love to cook. I believe every meal should be garnished. I’m a cat girl. I like pretty coloured fish and birds. I love flowers. Hanging out in coffee shops watching the world go by is one of my favourite pastimes. Blue and green should always be seen. I have a weak spot for bonnet dramas on the BBC. I love radio plays, audiobooks and podcasts. My toenails are painted bright metallic blue. I’m a sun bunny. I was born in New Zealand, moved to Australia, and immigrated to Canada when I was 11. I love vegemite on toast. If I had 2 heads, 4 hands and never slept I still wouldn’t get everything done on my list. I love small business. I can never have enough colour around me. 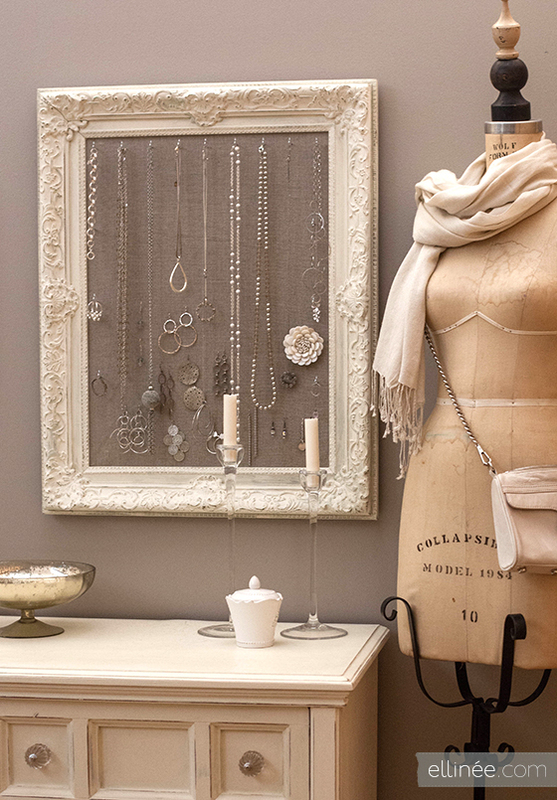 Join us at our Roncesvalles Store on Saturday, January 19th to welcome Sailor Girl Jewellery. 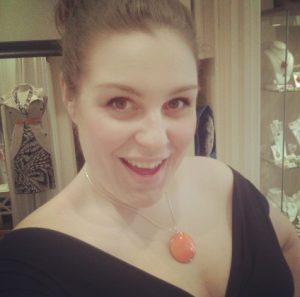 Meet designer Catherine and see a live glass firing and jewellery creation demo in store between 1-5pm! 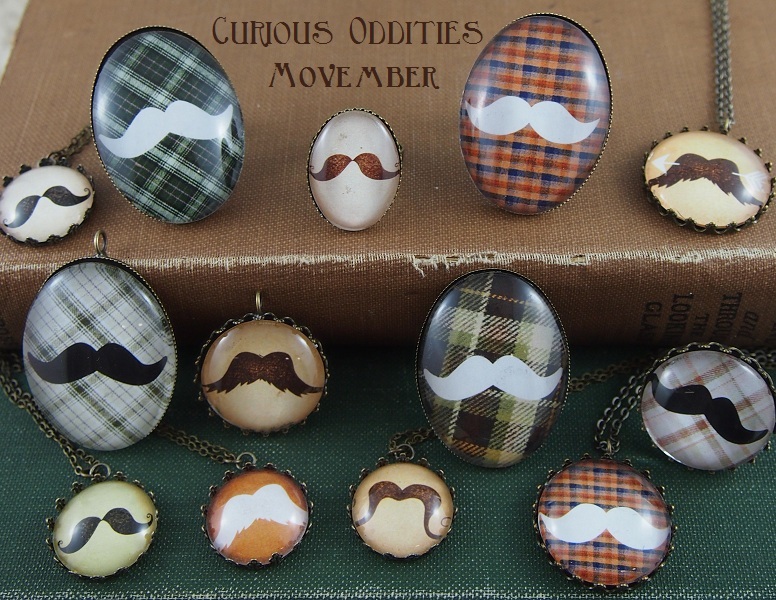 Supporting Movember in style with Curious Oddities! Joe’s MO has already raised $130 for the very worthy cause of men’s health, and now designer Kat Shura of Curious Oddities is lending a hand to support! 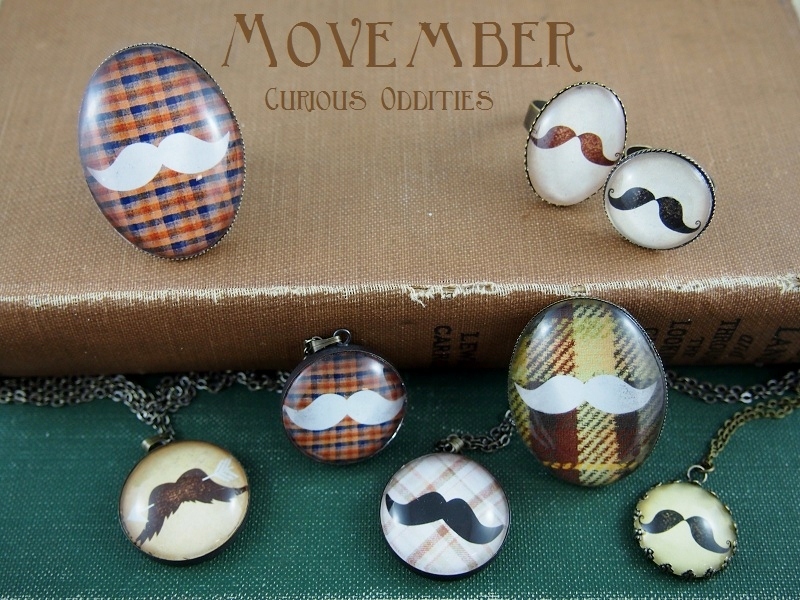 As of today, we have AMAZING Curious Oddities Movember jewellery! These adorable pieces featuring various moustache styles set against different background colours and patterns are not only stylish and fun, but will have you feeling darn good about yourself. Why? Because $3 from every sale of a Movember piece will go directly to Movember! 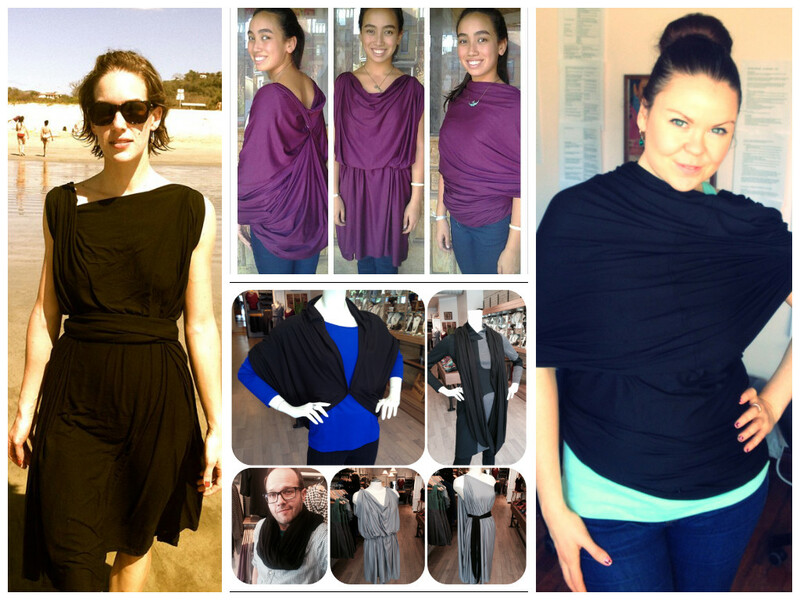 These pieces are currently in-store at Queen St and Roncesvalles and are making their way to Kensington as we speak! You’ll walk out with a brand new MO and the knowledge that you helped change the face of Men’s health! WIN WIN! Can’t make into store today? You can still contribute by donating to Joe’s Mo HERE.